Stephanie Brown, RN, IBCLC has over 20 years experience. This class is only $20 per couple! (Free to all Plano Birthplace clients). Register today, classes fill up fast! If you are birthing at Plano Birthplace- please register below. All expectant moms and their partners in the community are welcome to attend this class. Birth Boot Camp is a fully comprehensive childbirth class in which couples will learn everything they need to know about pregnancy, labor, postpartum, newborn care, and breastfeeding. Class is held at Plano Birthplace in Plano, TX and will meet every Sunday afternoon from 7:00-9:30pm for 10 weeks. Couples in the class will receive a 170+ page workbook and a downloadable breastfeeding video course. Why HypnoBirthing? Let's face it, our society likes to be dramatic. Many times the only experience we have with birth is what we see from Hollywood or what our "well meaning" friends and family tell us about their experiences. ----- Can I let you in in on a little secret? Birth doesn't have to be dramatic, it can be *AMAZING*! HypnoBirthing helps you remove the fear and doubt in your mind so you can feel calm, comfortable, confident and totally ready to have a transformational experience into motherhood. That's why I used HypnoBirthing when I had my daughter. It spoke to me because it focuses on the fact that our bodies already KNOW what to do and how to do it -- we just have to get out of the way and LET that happen. I knew I wanted to feel relaxed and be in control of my birth... and HypnoBirthing gave me the tools to do just that! In fact, no one believed I was really in labor. After my birth, I became passionate about telling women about the benefits of studying and using HypnoBirthing, and they saw the same life changing things happen to them... women were rocking their births! This class series is 5 sessions long and will includes topics like physiological birth, fear release, deep relaxation, massage and breathing techniques. We even include your birth partner in our class visualizations so they can experience first hand how great you'll feel and will be better equipped to support you. Most women even report a deeper connection with their partner and unborn baby after practicing HypnoBirthing together. Pregnancy Yoga Workshop at Park Cities Yoga. $30 for 3 week series (English and Spanish) Carla is a Registered Nurse with a Master’s Degree in Nursing. Her specialty is Clinical Immunology and Rheumatology (adults and pediatrics), and she also has experience in breastfeeding clinics, mental health, and psychiatry. She started the yoga journey in 2014, and now, during her first pregnancy, she wishes to share her experience as a health professional and as a yoga practitioner. Carla ́s is a graceful, purposeful approach to childbirth and motherhood. In a supportive setting, the workshop will focus on the natural process of pregnancy. She re-affirms the confidence women need during this great period of life, the “Goddess-like state”. We offer a childbirth series, taught by a certified childbirth educator, designed specifically for families planning natural births. For clients of Plano Birthplace, this childbirth class cost is included in your all-inclusive plan and will meet the childbirth education requirement for first-time families. Classes begin October 8th, reserve your spot now! 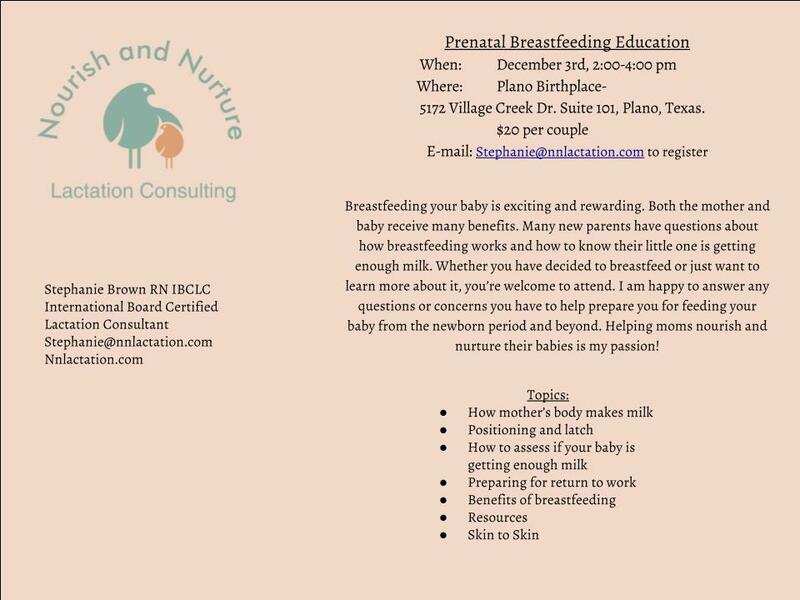 Please Contact Jacqueline Shannon at Naturalbirthblessings@gmail.com or (972) 658-0844 to enroll in the classes. All you have to tell her is that you are a Plano birthplace client and she will know to bill Plano Birthplace. Studies have found women that are well-prepared ahead of time about exactly what to expect during the birthing process have a very high success rate for birthing naturally. The classes taught at Plano Birthplace include support related to mental, emotional and physical aspects of birthing. Come join us for an informative class on breastfeeding. This Class is taught by Stephanie Brown, RN, IBCLC. She is an International Board Certified Lactation Consultant that has been helping women and families for over 20 years. This course is included in the all-inclusive global midwifery package for all Plano Birthplace clients. The cost is only $20 per couple for anyone in the community that would like to attend. Please email Stephanie@nnlactation.com to register. We are super excited to announce: Stephanie Brown, RN, IBCLC is coming to Plano Birthplace in October 2017! She's an International Board Certified Lactation Consultant that has a passion for helping women breastfeed. Plano Birthplace clients- this is free for you! Anyone from the community can join in for only $20 for the class! This is such an amazing awesome deal! Hurry and register- the class will fill up quickly!